Niknahad, H., Jamshidzadeh, A., Abbasian, M., Rezaeian Mehrabadi, A. (2012). Hepatoprotective Effect of Pomegranate (Punica Granatum) Fruit Juice and Seed Extracts against CCL4-Induced Toxicity. Iranian Journal of Pharmaceutical Sciences, 8(3), 181-187. Hossein Niknahad; Akram Jamshidzadeh; Marjan Abbasian; Abbas Rezaeian Mehrabadi. "Hepatoprotective Effect of Pomegranate (Punica Granatum) Fruit Juice and Seed Extracts against CCL4-Induced Toxicity". 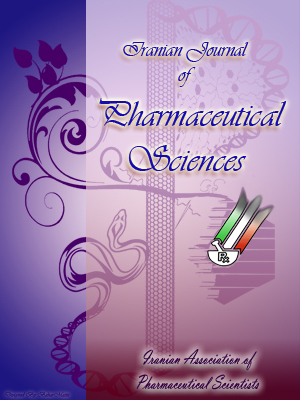 Iranian Journal of Pharmaceutical Sciences, 8, 3, 2012, 181-187. Niknahad, H., Jamshidzadeh, A., Abbasian, M., Rezaeian Mehrabadi, A. (2012). 'Hepatoprotective Effect of Pomegranate (Punica Granatum) Fruit Juice and Seed Extracts against CCL4-Induced Toxicity', Iranian Journal of Pharmaceutical Sciences, 8(3), pp. 181-187. Niknahad, H., Jamshidzadeh, A., Abbasian, M., Rezaeian Mehrabadi, A. Hepatoprotective Effect of Pomegranate (Punica Granatum) Fruit Juice and Seed Extracts against CCL4-Induced Toxicity. Iranian Journal of Pharmaceutical Sciences, 2012; 8(3): 181-187. Punica granatum is used as a medicinal plant, and its fruit concentrate has been used for the prevention and treatment of liver diseases in Iran. The effects of different concentrations of the hydroalcoholic, ethyl acetate and n-hexane extracts of the Punica granatum (fruit juice and seed) were investigated against CCl4- induced cytotoxicity in HepG2 cells. Concentrations (1-10000 µg/ml) of the extracts were added to the cells, 1 h before the addition of 100 mM of CCl4. After 24 h, the cells were evaluated for toxicity, TBARs level and GSH content. The hydroalcoholic extracts of fruit juice and seeds with concentrations of 100 to 1000 µg/ml protected the cells against CCl4 induced cytotoxicity, but the ethyl acetate extract of fruit juice with higher concentration (1000 µg/ml) protected the cells against CCl4 cytotoxicity and the n-hexane extracts were less effective. The ethyl acetate and n-hexane extracts of seeds with different concentrations did not have any significant protective effect. The Punica granatum extracts themselves were not toxic towards cells with concentrations up to 1 mg/ml. Therefore, the results of the present study are somehow consistent with traditional beliefs about hepatoprotective effects of Punica granatum. The reactive oxygen species (ROS) including superoxide anion radical, hydrogen peroxide (H2O2) and hydroxyl radicals (•OH.) are implicated in oxidative damage to various cellular macromolecules . Several synthetic antioxidants such as butylated hydroxyanisole (BHA) and butylated hydroxytoluene (BHT) are available, but they are quite unsafe and their toxicity is a problem of great concern . Many natural compounds are now known to have a modulator role on physiological functions and biotransformation reactions involved in the detoxification process, thereby affording protection from cytotoxic, genotoxic, and metabolic actions of environmental toxicants . Table 1. Extraction yield and total phenolic content of Pomegranate juice and seed by various solvents. Note: Total phenolic content (gallic acid equivalent g/100 g dry extract). Abbreviations: JEE: Juice ethyl acetate extract; JHE: Juice hydro alcoholic extract; JNE: Juice n-hexane extract; SEE: Seed ethyl acetate extract; SHE: Seed hydro alcoholic extract; SNE: Seed n-hexane extract. Punica granatum (PG) (Punicaceae), commonly known as pomegranate, is a shrub or a small tree, native to the Mediterranean region. A number of biological activities such as antitumour , antibacterial , antidiarrhoeal , antifungal , antiulcer  effects have been reported on various extracts/constituents of different parts of this plant. Also, PG is now gaining importance because of its potent antioxidant activity. PG fruit juice, peel extracts, seed oil and seed extracts have been found to possess a potent antioxidant activity [9-11]. Also, PG juice has been shown to modulate the expression of oxidation-sensitive genes in cultured endothelial cells and in atherosclerosis-prone areas of hypercholesterolemic mice . The protective activity of pomegranate flower extract was demonstrated against ferric nitrilotriacetate (Fe-NTA) induced hepatoxicity in mice. Fe-NTA is known to generate ROS and induce oxidative stress in the liver and kidney. Also, hepatoprotective role and antioxidant capacity of pomegranate flowers infusion against trichloroacetic acid was studied in rats. This study revealed that constituents present in PG can create protection against carcinogenic chemical induced oxidative injuries . In the Persian folk medicine, the concentrate of PG fruit juice has been considered to be hepatoprotective and blood purifier. However, to our knowledge no report is available on such effects of the juice and seed extracts. The present study was undertaken to investigate the hepatoprotective activity of different extracts of fruit and seed demonstrates any against CCl4 induced damage in HepG2 cells. Also, its hepatopro-tective effect was compared to the effect of silymarin which is known to be hepatoprotec-tive against CCl4- or acetaminophen-induced liver damages. Human liver cancer cell line HepG2 was obtained from Pasteur Institute, Tehran, Iran. RPMI-1640 and FBS were from GibCo, United States. Trypon blue, methylthiazoly-diphenyl-tetrazolium bromide (MTT), DTNB, and Na2HPO4 were from Merck, Germany, and thiobarbituric acid was from Sigma Chemical Company, Germany. All other used chemicals of high quality were available in the market. Fresh Punica granatum (pomegranate) fruit was purchased during November 2010, from local market in Shiraz, Fars, Iran, and was authenticated by Prof. Khosravi at the Botany Department, Shiraz University, where voucher specimens were maintained. The fruits were manually peeled and then the juice was prepared by manual press machine and then concentrated by a rotary evaporator under reduced pressure at 55 °C till the residue remained at a constant weight. The remaining seed was washed carefully, air-dried and ground into fine powder by laboratory mill. The materials were stored at refrigerator till later use. Total phenol contents of the extracts were determined using Folin–Ciocalteu method  and gallic acid was used as a standard. Human hepatoma cell lines (HepG2) were cultured and maintained in RPMI-1640, pH 7.3, containing 0.37% NaHCO3 supplemented with 10% FCS (fetal bovine serum albumin), 1% penicillin and streptomycin (100 IU/ml penicillin and 100 IU/ml streptomycin) in a humidified 5% CO2-95% air mixture at 37 ºC. Cells were seeded in 96-well microplates (30000 cells/well/90 µl) and routinely cultured in a humidified incubator for 24 h. The cells were then treated with different concentrations from 10 µg/ml to 10 mg/ml of the fruit juice and seed extracts (10 µl/well. ), 1 h before CCl4 (100 mM) exposure. A control group (RPMI-1640 without fruit juice and seed extract) and a positive control group (silymarin 20 µg/ml) were also included. After 24 h of incubation, 10 µl MTT solution was added to every well, cells were re-incubated for an additional 4 h. The cell culture media and MTT solution were removed and the cells remained in the bottom of the wells. Then, 100 µl of DMSO was added to each well to dissolve the formazan crystals formed. The absorbance of the converted dye was measured at a wavelength of 570 nm. Six wells were used for each concentration of fruit juice and seed extracts, and three independent experiments were performed for each extract . As a biomarker for lipid peroxidation, concentration of thiobarbituric acid-reactive agents was measured. HepG2 cells (3×106 cells/flask) were preincubated in flasks for 24 h at 5% CO2-95% air at 37 ºC. The control cultures were prepared by adding only RPMI-1640. After incubation with or without extract, the culture medium was removed. Having been rinsed with 0.5 ml free PBS twice, cells were collected by trypsinization. After determining the viability of the detached cells, 250 µl of 70% (w/v) trichloroacetic acid containing 1 ml of 0.8% (w/v) thiobarbituric acid with 750 ml deionized water was added to the cells and shaken with vortex. The suspensions were transferred into glass tubes and boiled for 30 min. After cooling to room temperature and centrifugation for 10 min at 5000 rpm, the absorbance of the supernatant was determined at 532 nm . Table 2. Cytotoxicity of pomegranate juice and seed extracts on HepG2 cells. Note: (Values are Means ± SD). Abbreviations: JEE: Juice ethyl acetate extract; JHE: Juice hydro alcoholic extract; JNE: Juice n-hexane extract; SEE: Seed ethyl acetate extract; SHE: Seed hydro alcoholic extract; SNE: Seed n-hexane extract. ***Significantly different from the control group ( p < 0.001). HepG2 cells (3×106 cells/flask) were pre-incubated in flasks for 24 h at 5% CO2-95% air at 37 ºC. Cells were rinsed with PBS and were collected by trypsinization, after determining the viability of detached cells, 200 µl of 20% trichloroacetic acid with 1800 µl of PBS were added to the cell suspension. Having shaken with vortex and centrifuging, we divided the supernatant into two even parts (each 1 ml). To measure the reduced glutathione (GSH), two ml of Na2HPO4 (0.3 M) and 0.5 ml of DTNB (0.01 M) were added to 1 ml of the supernatant and was shaken with vortex. The absorbance was then measured at 412 nm. For oxidized glutathione (GSSG), 1 ml of 5% sodium borohydrid was added to 1 ml of the supernatant, and incubated for 1 h at 45 ºC, then 0.5 ml of Na2HPO4 (0.3 M) was added to each tube. After neutralization with HCl (2.7 N), 0.5 ml of DTNB (0.01 M) was added and shaken with vortex. The absorbance was then measured at 412 nm . Carbon tetrachloride was toxic towards HepG2 cells in a dose-dependent manner. It caused loss of cell viability for 24 h with and LC50 of about 100 mM (data not shown). As shown in Table 1, the yields of juice and seed extracts were sequentially ethyl acetate > hydro-alcoholic > n-hexane. The results presented in Table 2 indicate that the incubation of HepG2 cells for 24 h with concentrations of 100 to 1000 µg/ml of each of the extracts did not have any toxicity on the cells, but higher concentrations were toxic. protection against CCl4 cytotoxicity with a concentration of 20 µM (Table 3). Table 3. Cytopreotective activity of silymarin against CCl4 induced toxicity. The results presented in Table 4 indicated that the preincubation of HepG2 cells with 100 to 1000 µg/ml of the ethyl acetate or 1000 µg/ml hydro-alcoholic extracts of PG juice 1 h before CCl4 (100 mM) leads to the reduction of cytotoxicity. But the n-hexane extract with similar concentrations did not protect against CCl4–induced cytotoxicity. Also, preincubation of cells with the hydro-alcoholic seed extract (100 to 1000 µg/ml) reduced toxicity of CCl4, but the n-hexan and ethyl acetate extracts of varying concentrations did not have any protective effects on CCl4 toxicity. Incubation of the cells with 100 mM CCl4 for 24 h decreased the GSH content of the cells and increased GSSG and TBARs levels (Table 5). Incubation of the cells with hydro-alcoholic (1000 µg/ml) and ethyl acetate (100 to 1000 µg/ml) of fruit juice extracts significantly prevented GSH reduction induced by CCl4, and prevented increase of TBARs levels induced by CCl4 (Table 5). However, the seed extracts did not significantly TBARs or GSH content affected by CCl4. Carbon tetrachloride-induced hepatic injury is commonly used as an experimental method for the study of hepatoprotective effects of drugs or medicinal plants’ extracts, by in vivo and in vitro techniques [18, 19]. CCl4 is believed to be metabolized by microsomal CYP450 in the liver to a highly reactive trichloromethyl free radical (•CCl3) which can start a chain of reactive free radical formation resulting in peroxidation of lipids and damage to the proteins and components of the cells which can result in cell lyses [20, 21]. The protective and antioxidant properties of Punica granatum flowers infusion against trichloroacetic acid was evaluated in rats, and it was shown that the plant beverage supplement impart protection against carcinogenic chemical induced liver injury and oxidative stress . However, the hepatoprotective activity of Punica granatum has not been intensively studied, and it can serve a further research area. In the present study the ability of different extracts of pomegranate fruit juice and seed to prevent the CCl4 toxicity in HepG2 cells was evaluated. The results showed that hydro-alcoholic and ethyl acetate extracts of fruit juice and seed extracts of pomegranate reduced cytotoxicity of CCl4. GSH depletion and TBARs content of the cells was increased by CCl4 and only hydro- alcoholic and ethyl acetate extracts of fruit juice were effective, indicating that the water soluble compounds of fruit were effective in preventing the toxicity induced by CCl4. The respective cytoprotective and hepato-protective effects against CCl4 could be by one or several mechanisms such as: inhibition of CYP450 responsible for the metabolism of CCl4 to reactive free radicals; antioxidant effects; scavenging free radicals responsible for cell damage; or induction or regeneration of the liver cells. Table 4. Cytopreotective activity of pomegranate juice and seed extracts against CCl4 induced toxicity. Note: Values are Means ± SD. Abbreviations: JEE: Juice ethyl acetate extract; JHE: Juice hydro alcoholic extract; JNE: Juice n-hexane extract; SEE: Seed ethyl acetate extract; SHE: Seed hydro alcoholic extract; SNE: Seed n-hexane extract. ***Significantly different from the control group (p < 0.001). +++Significantly different from the CCl4 –treated group (p < 0.001). ++ Significantly different from the CCl4 –treated group (p < 0.01). +Significantly different from the CCl4 –treated group (p < 0.05). Antioxidant activities of pomegranate fruit, fruit juice, peel extracts, seed oil and seed extracts have been found to possess a potent antioxidant activity [22, 23]. Previous studies suggest that pomegranate flowers, too, boost an enormous antioxidant activity. Antioxidant potential of pomegranate juice and extracts is attributed to their high polyphenolics content including ellagic acid and ellagitannins . Other researches have shown that pomegranate peel extract has markedly higher antioxidant capacity than the pulp extract. Among methanol, ethyl acetate and n-hexane, used for extraction of antioxidants from pomegranate peel and seed, ethyl acetate yields to maximum antioxidant activity . Pomegranate fruit and peel extracts [11, 26] have also been reported to inhibit lipid peroxidation and both seem to possess more potent antiperoxidative activity than pomegranate flower extract. Table 5. Effects of pomegranate juice and seed extracts on GSH, GSSG and TBARS levels of HepG2 cells. Note: Values are Means±SD. Abbreviations: JEE: Juice ethyl acetate extract; JHE: Juice hydro alcoholic extract; JNE: Juice n-hexane extract; SEE: Seed ethyl acetate extract; SHE: Seed hydro alcoholic extract; SNE: Seed n-hexane extract. ***Significantly different from the control group (p < 0.001). +++Significantly different from the CCl4 –treated group (p < 0.001). *Significantly different from the control group (p < 0.05). No toxic effects of Punica granatum in mice treated with aqueous extracts of pomegranate similar to those used in folk medicine was observed . Vidal  reported that toxic effects of Punica granatum fruit extract occurred at higher doses than those effective in the models where the anti-viral activity has been studied or than those doses used in Cuban folk medicine. In conclusion, the present study demonstrates that the alcoholic and ethyl acetate extracts of pomegranate possess a potent free radical scavenging, antioxidant and hepatoprotective activities. The results suggest that regular intake of pomegranate juice possessing varied biological activities could be potentially useful for the prevention of chronic degenerative liver diseases. The research was supported by a grant from Shiraz University of Medical Sciences, Shiraz, Iran. The paper was part of a MSc student thesis, at Faculty of Pharmacy, Shiraz University of Medical Sciences. Farber JL. Mechanisms of cell injury by activated oxygen species. Environ Health Perspect 1994; 102: 17-24. Madhavi DL, Salunkhe DK. Aspects of food antioxidants. In: Madavi DL, Deshpande SS, Salunkhe DK, (Eds.). Food Antioxid 1995; p. 267. Saha P, Das S. Regulation of hazardous exposure by protective exposure modulation of phase II detoxification and lipid peroxidation by Camellia sinensis and Swertia chirata. Teratog Carcinog Mutagen 2003; 1: 313-22. Afaq F, Saleem M, Krueger CG, Reed JD, Mukhtar H. Anthocyanin- and hydrolyzable tannin-rich pomegranate fruit extract modulates MAPK and NF-kappaB pathways and inhibits skin tumorigenesis in CD-1 mice. Int J Cancer 2005; 113: 423-33. Prashanth D, Asha MK, Amit A. Antibacterial activity of Punica granatum. Fitoterapia 2001; 72: 171-3. Das AK, Mandal SC, Banerjee SK, Sinha S, Das J, Saha BP, Pal M. Studies on antidiarrhoeal activity of Punica granatum seed extract in rats. J Ethnopharmacol 1999; 68: 205-8. Dutta BK, Rahman I, Das TK. Antifungal activity of Indian plant extracts. Mycoses 1998; 41: 535-6. Gharzouli K, Khennouf S, Amira S, Gharzouli A. Effects of aqueous extracts from Quercus ilex L. root bark, Punica granatum L. fruit peel and Artemisia herba-alba Asso leaves on ethanol-induced gastric damage in rats. Phytother Res J 1999; 13: 42-5. Cerda B, Llorach R, Ceron JJ, Espin JC, Tomas-Barberan FA. Evaluation of the bioavailability and metabolism in the rat of punicalagin, an antioxidant polyphenol from pomegranate juice. Eur J Clin Nutr 2003; 42: 18-28. Gil MI., Tomas-Barberan FA, Hess-Pierce B, Holcroft DM, Kader AA. Antioxidant activity of pomegranate juice and its relationship with phenolic composition and processing. J Agric Food Chem 2000; 48: 4581-9. Noda Y, Kaneyuki T, Mori A, Packer L. Antioxidant activities of pomegranate fruit extract and its anthocyanidins: delphinidin, cyanidin, and pelargonidin. J Agric Food Chem 2002; 50: 166-71. De Nigris F, Williams-Ignarro S, Lerman LO, Crimi E, Botti C, Mansueto G, D'Armiento FP, De Rosa G, Sica V, Ignarro LJ, Napoli C. Beneficial effects of pomegranate juice on oxidationsensi- tive genes and endothelial nitric oxide synthase activity at sites of perturbed shear stress. Proc Natl Acad Sci 2005; 102: 4896-901. Celik I, Temur A, Isik I. Hepatoprotective role and antioxidant capacity of pomegranate (Punica granatum) flowers infusion against trichloroacetic acid-exposed in rats. Food Chem Toxicol 2009; 47: 145-9. Vernon LS, Orthofer R, Lamuela-Raventos RM. Analysis of total phenols and other oxidation substrates and antioxidants by means of Folin- Ciocalteu reagent. Methods Enzymol 1999; 299: 152-78. Bogdadi HA, Kokoska L, Havlik J, Kloucek P, Rada V, Vorisek K. In vitro antimicrobial activity of some Libyan medicinal plant extracts. Pharm Biol 2007; 45: 386-91. Yang HP, Hung TL, You TL, Yang TH. Genome- wide comparative analysis of the highly abundant transposable element DINE-1 suggests a recent transpositional burst in Drosophila yakuba. Genetics 2005; 173: 189-96. Kiso Y, Tohkin M, Hikino H. Assay method for antihepatotoxic activity using carbon tetrachloride induced cytotoxicity in primary cultured hepatocytes. Planta Medica 1983; 49: 222-5. Allis JW, Ward TR, Seely JC, Simmons JE. Toxic effects of carbon tetrachloride on rats. Fund Appl Toxicol 1990; 15: 558-70. Tomasi A, Albano E, Banni SB, Corongiu F. Free radical metabolism of carbon tetrachloride in rat liver mitochondria. Biochemistry 1987; 46: 313-7. Clawson GA. A mechanism of carbon tetrachloride hepatotoxicity. Pathol Immunopath Res 1989; 8: 104-12. Singh RP, Chidambara Murthy KN, Jayaprakasha GK. Studies on the antioxidant activity of pomegranate (Punica granatum) peel and seed extracts using in vitro models. J Agric Food Chem 2002; 50: 81-8. Kaur G, Jabbar Z, Athar M, Alam MS. Punica granatum (pomegranate) flower extract possesses potent antioxidant activity and abrogates Fe-NTA induced hepatotoxicity in mice. Food Chem Toxicol 2006; 44: 984-93. Seeram NP, Adams LS, Henning SM., Niu Y, Zhang Y, Nair MG, Heber D. In vitro antiprolif- erative, apoptotic and antioxidant activities of punicalagin, ellagic acid and a total pomegranate tannin extract are enhanced in combination with other polyphenols as found in pomegranate juice. J Nutr Biochem 2005; 16: 360-7. Li Y, Guo Ch, Yang J, Wei J, Xu J, Cheng Sh. Evaluation of antioxidant properties of pomegranate peel extract in comparison with pomegranate pulp extract. Food Chem 2006; 96: 254-60. Sudheesh S, Vijayalakshmi NR. Flavonoids from Punica granatum-potential antiperoxidative agents. Fitoterapia 2005; 76: 181-6. Amorin A. Test of mutagenesis in mice treated with aqueous extracts from Punica granatum L. Revista Brasilena de Farmacia 1995; 74: 110-1. Vidal A, Fallarero A, Pena BR. Studies on the toxicity of Punica granatum L. (Punicaceae) whole fruit extracts. J Ethnopharmacol 2003; 89: 295-300.